The Co-Operative, Britain's sixth largest supermarket group, said today it could not guarantee shortages of some food products would be avoided in the event of a "no deal" Brexit. Recent signals from Brussels have buoyed hopes that the United Kingdom and the European Union can agree a proper divorce agreement before the UK leaves the bloc on March 29. But many business chiefs and investors fear politics could scupper an agreement, thrusting the world's fifth largest economy into a "no-deal" Brexit that they say would clog up the arteries of trade. After the Co-op published first-half results, Jo Whitfield, its chief executive of food, was asked if she could reassure her customers there would not be shortages in such a scenario. "I don't think anybody would be in a position where they would be able to give that level of assurance," she told reporters. Whitfield said the Co-op had some protection from a hard exit from the EU because of its British supply base. "We're 100% British on all of our protein areas and our fresh meat. That flows across ingredients and in some of the core areas like ready meals and sandwiches," she said. "We're also very well protected in many areas around seasons - fruit and vegetables," she added. Whitfield said the Co-op was working closely with suppliers on contingency plans they have. "That can give us assurance and then (we're) thinking through how we want to adapt our promotions, our offers, and ensure that we can keep our shelves stocked as best as we can in any degree of disruption that may emerge." The Co-op is also seeking approval as an Authorised Economic Operator, which will help it avoid border delays in the event of a hard Brexit. Bigger rivals Morrisons and Asda already have that status. "We think that would give us a little bit more comfort were issues to arise at border control," said the Co-op group CEO Steve Murrells. Last month Brexit minister Dominic Raab sought to reassure Britons that the army would not be called in to distribute food in the event of a hard Brexit. The mutually-owned Co-op, which also operates funeral, legal and insurance businesses, reported an 86% rise in first-half profit today, driven by strong food sales and the purchase of the Nisa business. Its pre-tax profit was £26m in the 26 weeks to July 7, on group sales that rose 10% to £5 billion. Food retail like-for-like sales rose 4.4%, and the Co-op has now enjoyed 18 quarters of underlying sales growth in a row. It also today announced the acquisition of Dimec, a healthcare technology platform, marking the Co-op's return to the £10.5 billion pharmacy market. It did not disclose how much it paid. 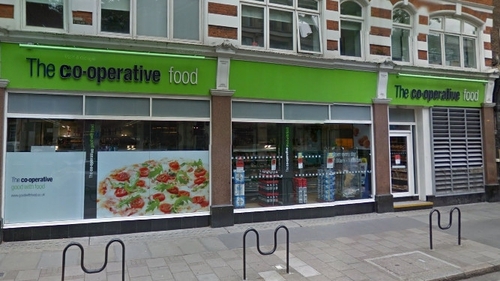 The Co-op nearly collapsed in 2013 after a £1.5 billion funding hole was found in its banking operation. It has since recovered, aided by the shift in Britons' grocery shopping habits towards more frequent trips to smaller convenience stores - the mainstay of its business. The Co-op no longer has a stake in the bank, which has restructured and recapitalised.